Consequent to 9/11 the US declared a war on terror and countries were told ‘you are either with us or against us’. The LTTE foreign brains quickly came up with an unregistered alliance putting together Tamil political parties under an umbrella name Tamil National Alliance with representatives selected by LTTE and Prabakaran. That was how TNA came into being on 22 October 2001 months before the Norwegian brokered ceasefire agreement of February 2002. 5000 LTTE ‘volunteers’ rigged the elections to enable TNA to enter Parliament in 2004 winning 22 seats (TNA even took oaths in front of Prabakaran) enabling LTTE appointed TNA to carry out propaganda locally and internationally misusing parliamentary privileges. Both TNA and LTTE are seeking the same objectives. TNA in 2001 declared in its manifesto that LTTE was the ‘sole Tamil national entity’ and the ‘sole representative of the Tamil people’ and LTTE had the right to negotiate on behalf of the Tamil people. TNA is linked to and associates with the UNSC Resolution 1373 banned LTTE fronts – TGTE / GTF/BTF and a host of others operating from overseas. TNA are regular attendees to these functions and guest speakers funded by the Tamil Diaspora. It is anyone’s guess as to why successive governments including the former failed to investigate or in the least openly declare TNA as representing the LTTE. Having said that it now emerges that the TNA leader R Sambanthan is claiming a stake as Opposition Leader making merry of the disunity that prevails inside Parliament. This takes us back to 1977 when A Amirthalingam of the TULF (formed in 1972) became the Opposition Leader from 1977 until 1983 with 18 seats to their credit. The United National Party (UNP) with 141 out of 168 parliamentary seats routed the Sri Lanka Freedon Party (SLFP) that won only eight seats. It was only because JR Jayawardena introduced the 6th amendment and with it the requirement for all Parliamentarians to take an oath of allegiance that the TULF walked out refusing to take the pledge including Anandasangaree who was as a result subsequently barred from practicing as a lawyer. “no person shall directly or indirectly, in or outside Sri Lanka, support, espouse, promote, finance, encourage or advocate the establishment of a separate within the territory of Sri Lanka”. The argument against Sambanthan’s selection as Opposition Leader draws upon the abuse and misuse that the TULF Leader Amirthalingam initiated as Opposition Leader. LTTE were first declared ‘our boys’ by him, he represented the Vaddukoddai (Constituency that he first contested from in 1952) ideology being a founder member of the Federal Party or rather Confederal/Federation party that plotted to use unemployed Tamil youth to deliver what the old cronies were dreaming about. Eventually he was gunned down by the very boys he wanted to rule over inside his own home in 1989. TULF Chavakachcheri MP V N Navaratnam openly supported LTTE and he introduced influential and wealthy Tamils living overseas to LTTE leaders. TULF propaganda helped LTTE by branding Sri Lanka guilty of discrimination and perpetrating genocide. By 1983 LTTE-TULF were already collecting funds from the overseas Tamil community. The first such public organization to collect funds was formed in 1978 through the Tamil Coordinating Committee in the UK to which Amirthalingam went on a world tour to campaign for misusing his title of Opposition Leader. In 1977 a person who wanted to secede and create a separate state became the Opposition Leader. The damage he did openly and clandestinely is phenomenal. 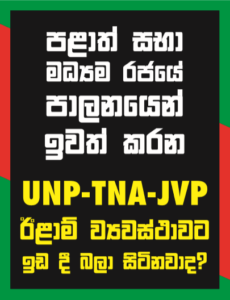 He used his position to internationalize his cause it was only in 1981 that the UNP presented a no-confidence motion against him. It was only Cyril Mathew who had the spine to criticize Amirthalingam inside Parliament. Though it must be said that it was Amirthalingam and Sivasithamparan who escorted Sirima Bandaranaike out of the chamber when her civic rights were taken away from her by JR Jayawardena. It was these same two that the LTTE shot at with Amirthaligam dying and Sivasithamparan miraculously surviving and Mrs. B had said ‘thank god no Sinhalese had done it’.